The range includes a line of three deodorants; Lemongrass and Lavender, Grapefruit and Cedarwood, and Bergamot and Aloe. The deodorant that I am currently using is the Grapefruit and Cedarwood one. I asked for this one to be sent as it's not a really strong nor sweet smell which is good for people like me who don't like strong scents. But little did I know until I got it, on the bottle it says "Natural, effective protection for men"....hmmm well then. However, to be honest there is nothing that leads me to think that women can't use it too. I reckon it's probably due to the fact it is more of a masculine, less zesty scent due to the Cedarwood. Oh well haha! 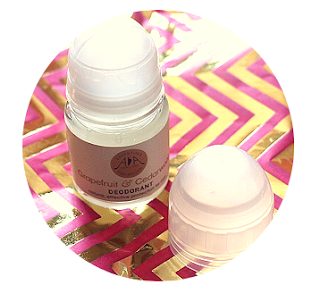 AA Skincare claim that their deodorants have "daylong protection without any nasties" which I think "nasties" is referring to any chemicals in ordinary deodorants. I ain't one to sweat a lot so one application in the morning does last me right till the end of the day with guarantee. Despite slightly getting put off this scent due to it saying it's aimed to men, overall I am pleased with this deodorant. 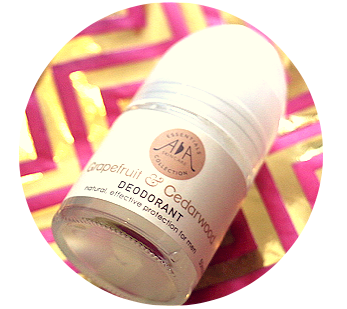 Not just because it is natural but it works well by keeping underarms dry and odourless for quite some time. It is also suitable for all skin types and includes Aloe Vera which helps to sooth skin and cool it down meaning that it's suitable after hair removal such as waxing or shaving. For only £4.94, I am really impressed with this deodorant and will look into buying another one (a different scent though!) and will even branch out to buying some of the other natural products they offer from face and eye gels to cleansing products. You can buy your own from www.ampora-retail.com. ANDDD just as I literally went to test out the link there I see that they have a wee sale going on right now so head over there right now if you want to grab one with money off! Overall what do you think about natural products? Do you try to go natural or does it not matter as long as it does it's job? Remember you can check out the full AA Skincare rage for inexpensive but natural products just by clicking here. This is a sponsored post. All products reviewed on this page were sent to me complimentary from AA Skincare. I only recommend products or services I try personally and believe my readers will enjoy. All opinions are my own.